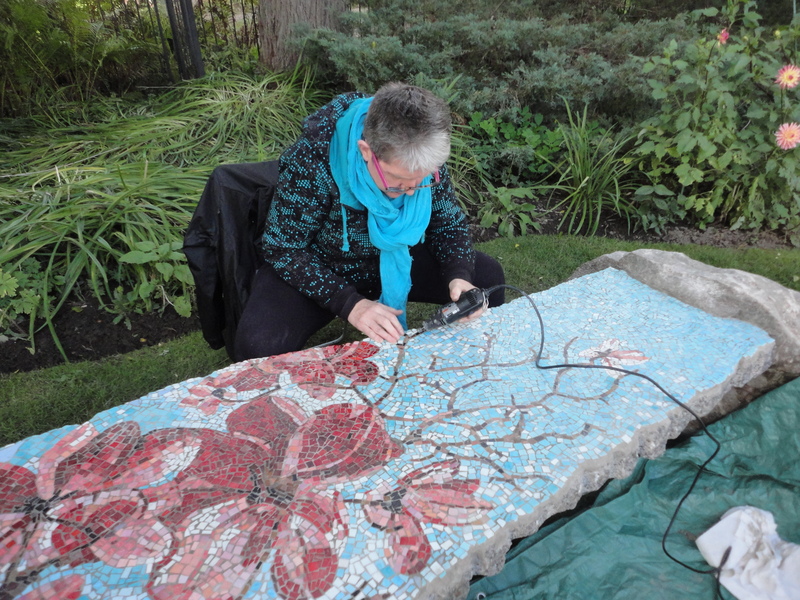 We’re donating this mosaic for an upcoming fundraiser supporting the Pelee Island Bird Observatory. This group of goldfinches lives at a residence in Paris Ontario. Camp Oochigeas is a privately funded, volunteer-based organization that provides kids with and affected by childhood cancer unique opportunities for growth through challenging, fun, enriching and magical experiences. This includes a camp in Muskoka as well as activities at their space at College and Bathurst in Toronto. I toured their Toronto facility today and it is really wonderful. We’re very pleased to support the Camp Ooch Paddle Project by creating the mosaic work, Featherweight. 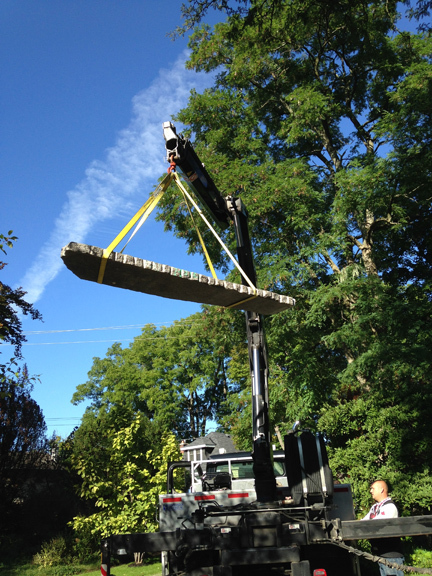 The paddle project has been happening since 2010. It was set up to raise awareness and funds by showcasing one-of-a-kind paddles designed by artists and celebrities. A selection of paddles will be auctioned at the Imagine the Magic Gala while others will be sold online through the Online #PaddleProject Auction. To learn more about Camp Ooch and the #PaddleProject please visit their website. We encourage you to support them if you can. They’re doing great work. This smaller mosaic was made to celebrate a wedding. We recently installed these two male cardinals at a home in Paris Ontario. They’re hanging on a set of wires which are designed for roses and clematis to grow on. As the plants mature, they can grow around the mosaics. These cardinals are traditional mosaics made with smalti glass tiles. 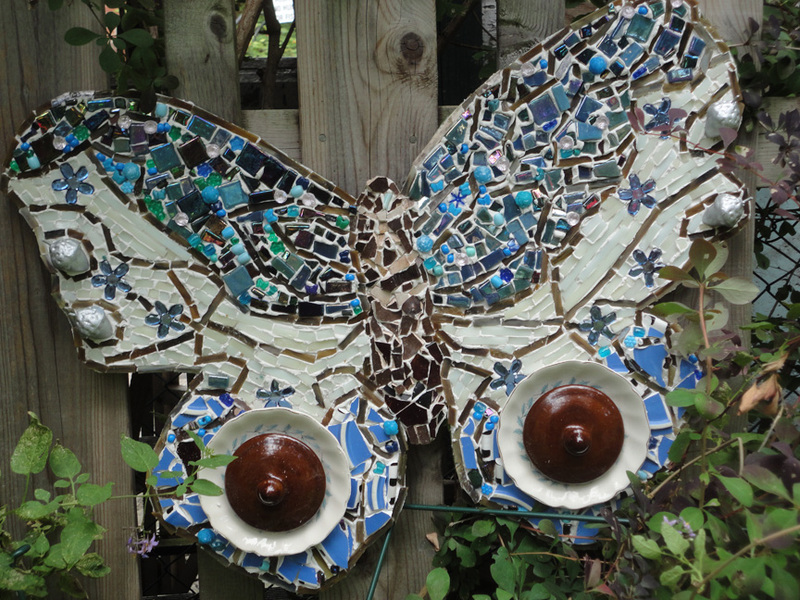 This cedar waxwing mosaic, made from broken crockery and tiles, has been installed at its new home near Perth Ontario. 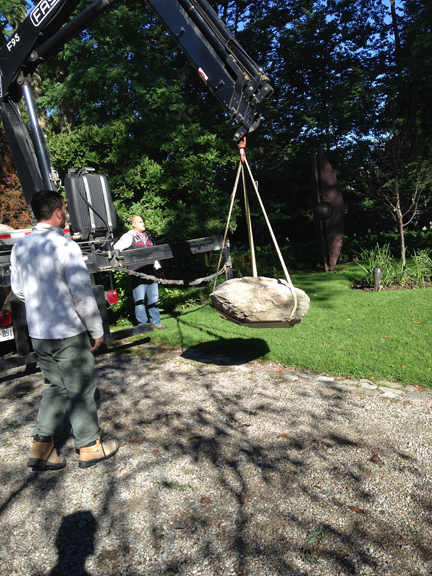 We donated 2 mosaics for a silent auction in support of the Pelee Island Observatory. Here’s Sheila at the Bird Ball. This scarlet tanager mosaic has just been grouted. We still have to do a final polish, clean up the edges and install hanging hardware on the back. This mosaic was made with Italian Smalti glass tiles, and was grouted. It’s fairly small, about 2 feet beak to the tip of the tail. Here’s another shot of it. 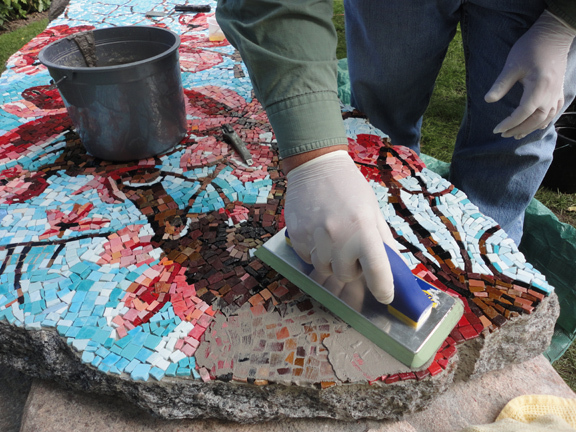 We’re keeping the night heron for our crazy kitchen – but we can create any kind of custom mosaic work for you. When the alewives came into shallow water to spawn over at Sam Smith Park, the black-crowned night herons showed up to enjoy the bounty. Standing on the bridge on the west side of the yacht club, looking north, some evenings we could spot 4 or 5 of these chunky birds. We decided to do a night heron mosaic. We did this one with Italian Smalti (glass) tiles on a birch plywood ground, and unlike the mosaics we do with broken crockery, we grouted this one. This mosaic is about 3 feet tall. This one has a 19 inch wingspan. 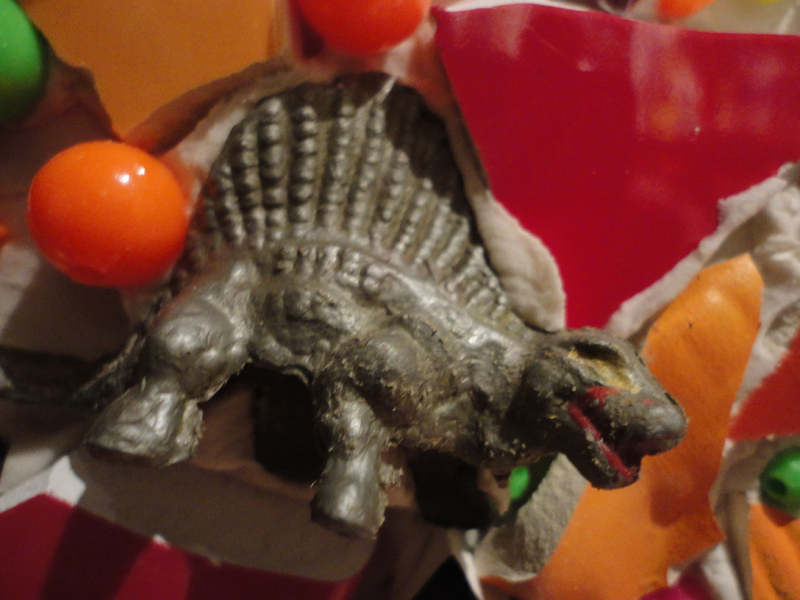 It’s made from broken crockery, ceramic tiles, a wooden bead (on the head) and two plastic animals (can you find them?). This butterfly has a wingspan of about 19 inches. It’s made with shells, broken crockery, ceramic tiles, smalti tiles, pennies, plastic flowers. This one is for our place on Twenty Seventh Street here in Toronto. These two new butterflies each have a wingspan of about 19 inches. 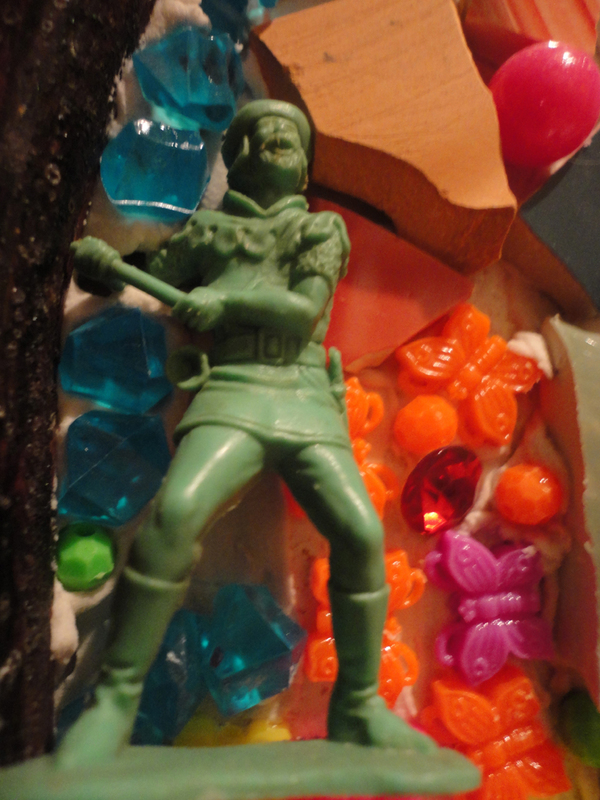 They’re made with broken crockery, ceramic and smalti tiles and a few surprises. 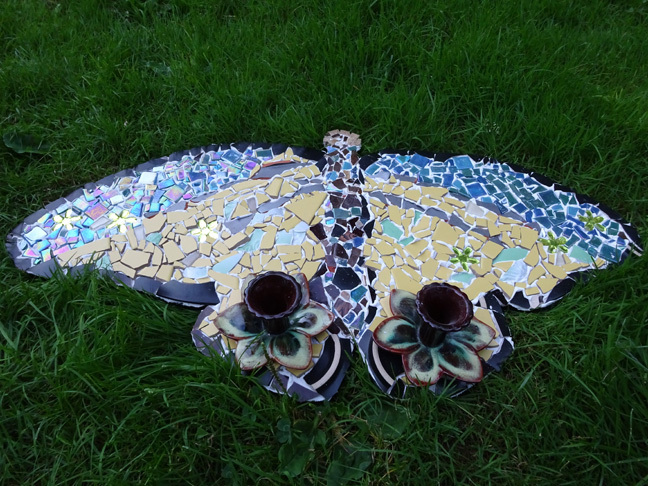 Some of our butterfly mosaics imitate actual butterfly species, but others like this “6-penny” butterfly made by Tuffy P as a gift, are completely improvised. Please visit our page at the Brain Project website to learn all about this project. If you like you can vote for us for “people’s choice” brain. This mosaic is in support of Baycrest Health Sciences. They do great work. If you would like to make a donation to Baycrest you can do so online here. Our brain is sponsored by Cineplex. 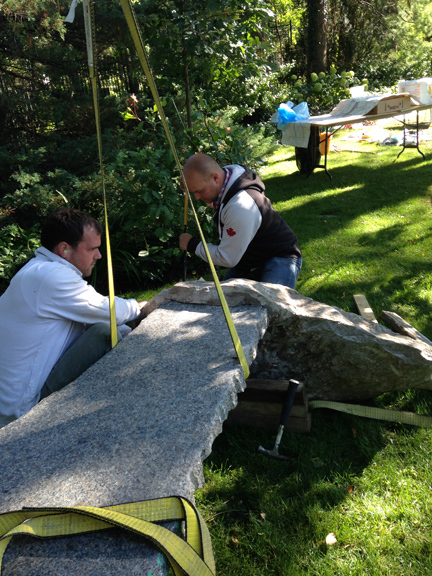 We’re currently working on a piece for The Brain Project in support of The Baycrest Foundation. 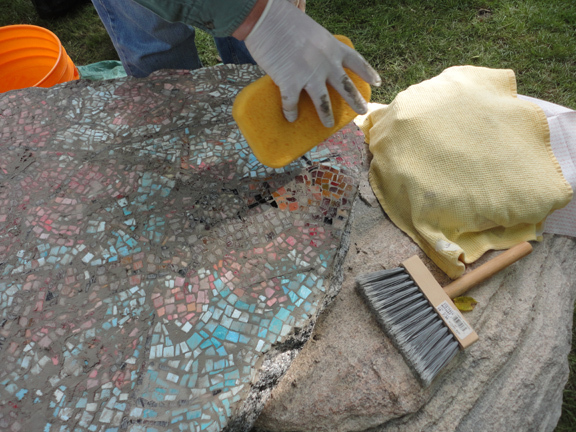 They have provided a cast over-sized brain and we’re transforming it with smalti tile mosaic. 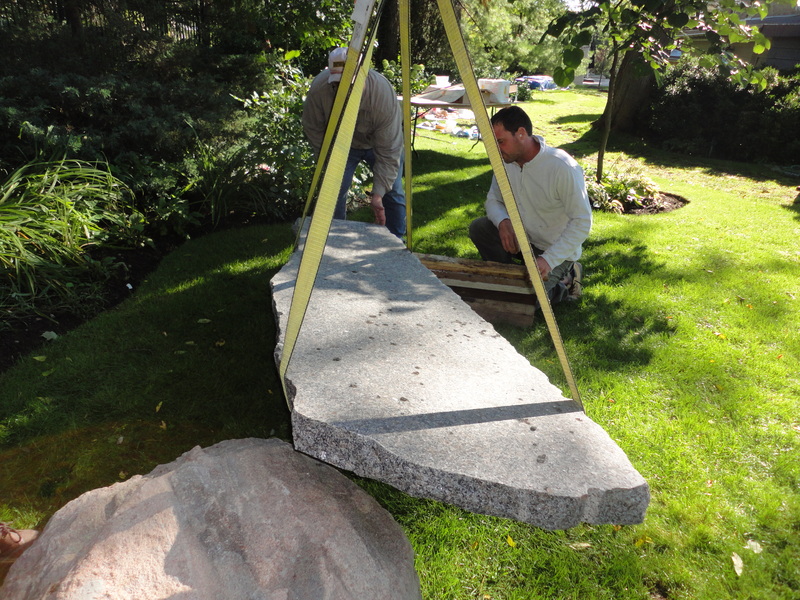 This work includes 5 giant monarch butterflies. Watch this site for updates. Sheila Gregory and Eugene Knapik have been active in the Toronto art scene since the mid-1980s. They have organized numerous large-scale group art exhibitions and are featured in the Collective City short film The Un-Collective. Sheila Gregory has published her ongoing series of photographs: The Left Overs online. Eugene Knapik is represented (for his paintings and drawings) at Yumart Gallery. His suite of short-short stories, The Lazy Allen Stories is available online, and he writes a personal blog called 27th Street. 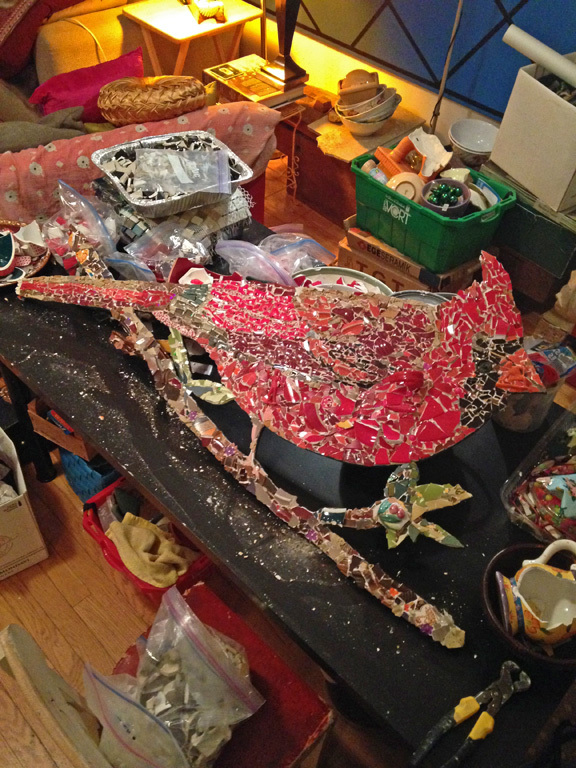 This photo shows the Long Branch Robin in process. 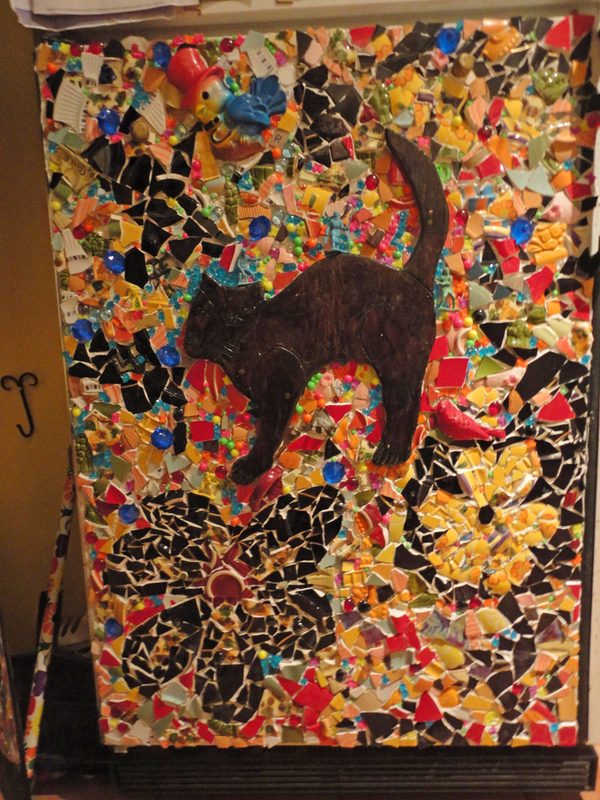 This mosaic is made from broken crockery, ceramic tiles and a few surprise items on a birch plywood ground. In recent winters, snowy owls have been spotted in Colonel Sam Smith Park and even closer to us on Twenty Third Street in Long Branch. These beautiful large birds were the inspiration for these two owls. This butterfly features saucers and lids! The Magnolia Bench is a traditional smalti tile mosaic. 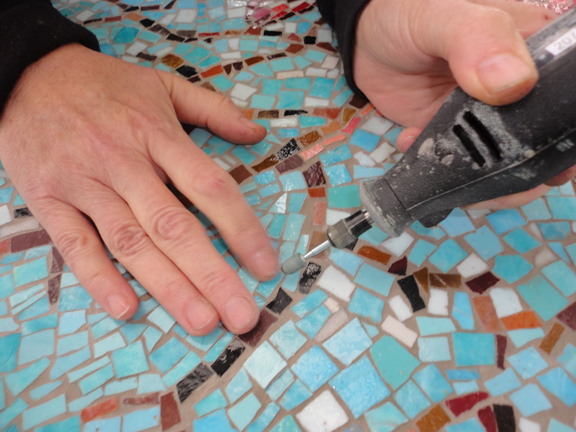 We grouted this mosaic with a fortified polimer grout called Permacolor. After the grout was spread on, we cleaned it up with damp sponges. We wanted to be sure there were no sharp edges on the bench so we spent some time identifying sharp spots and cleaning them up with a Dremel tool. 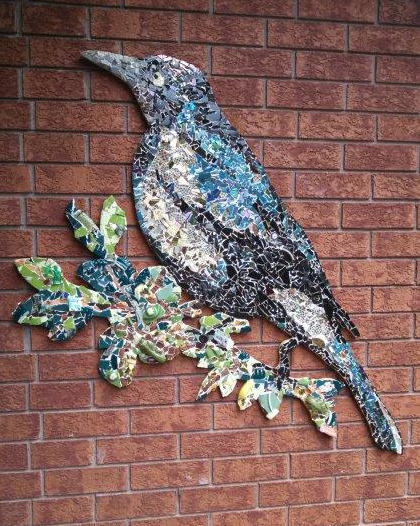 Here is a grackle mosaic at its home in Midland Ontario. For this project we included irridescent glass tiles to imitate the grackle’s feathers. The photo below shows the original wood cut-out and drawing. This male cardinal mosaic is playful and rich in detail. This full-door mosaic is in our home. We made this owl for the front of our home on Twenty Seventh Street in Long Branch. 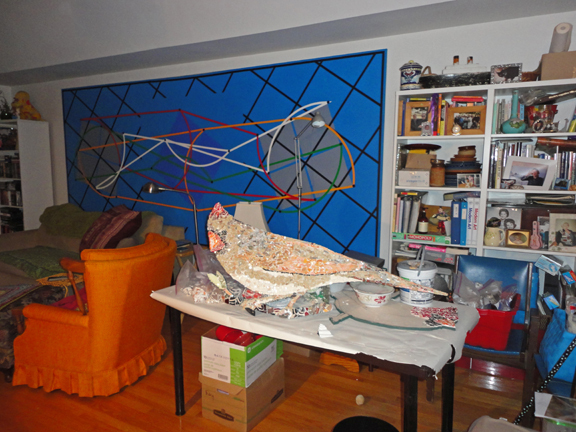 It was our first large-scale bird mosaic. 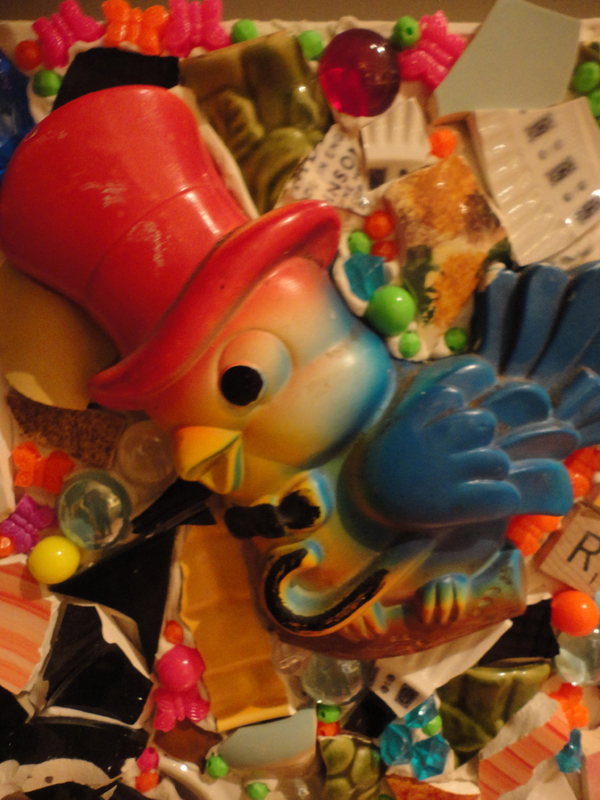 This was one of our first commissions and our first jay. This mosaic is close to four feet tall. 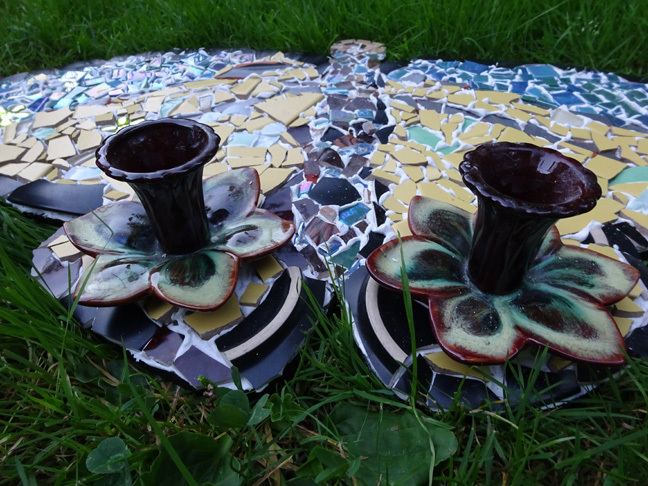 It’s made with an assortment of tiles, broken crockery, bits of glass and stone.